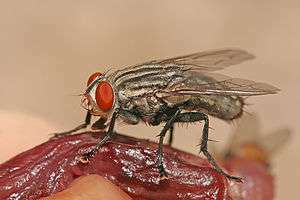 Flies in the family Sarcophagidae (from the Greek σάρκο sarco- = flesh, φάγε phage = eating; the same roots as the word "sarcophagus") are commonly known as flesh flies. 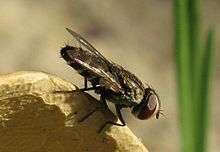 They differ from most flies in that they are ovoviviparous, opportunistically depositing hatched or hatching maggots instead of eggs on carrion, dung, decaying material, or open wounds of mammals, hence their common name. Some flesh fly larvae are internal parasites of other insects such as Orthoptera, and some, in particular the Miltogramminae, are kleptoparasites of solitary Hymenoptera. Members of the subfamily Sarcophaginae are small to large flies 0.16-0.9 in (4-23 mm) with black and gray longitudinal stripes on the thorax and checkering on the abdomen. Other key features include red eyes and a bristled abdomen. Abdominal sternites II and III are free and cover the margins of tergites. The posthumeral bristles are one or two in number, with the outermost pair missing. Vairo, Mello-Patiu and Carvalho give a short overview of the role of Sarcophagidae in medicolegal entomology. Pape, T., Dahlem, G., Mello Patiu, C.A. de & Giroux, M. 25 June 2010. The World of Flesh Flies (Diptera: Sarcophagidae). Accessed on [4 April 2012].